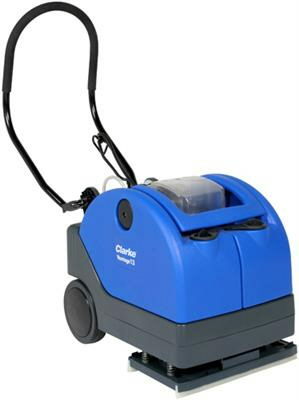 CLARKE VANTAGE 13" AUTO SCRUBBER SPRAYS CLEANING SOLUTIONS ON FLOORS, SCRUBS THEN VACUMS IN ONE PASS. USES BRUSHS FOR CLEANING,SCRUBBING OR STRIPPING. COMPACT & LIGHTWEIGHT FOR CLEANING SMALLER AREAS INCLUDING KITCHENS, ENTRYWAY, RESTROOMS OR ANY FLAT SURFACE AREA. LENGTH 44.1" WIDTH 15.1 (WITH SQUEEGEE) HEIGHT 39.7"
* Please call us for any questions on our scrubber floor 13 inch auto rentals in Portland OR, Gresham OR, Milwaukee OR, and surrounding metro area.